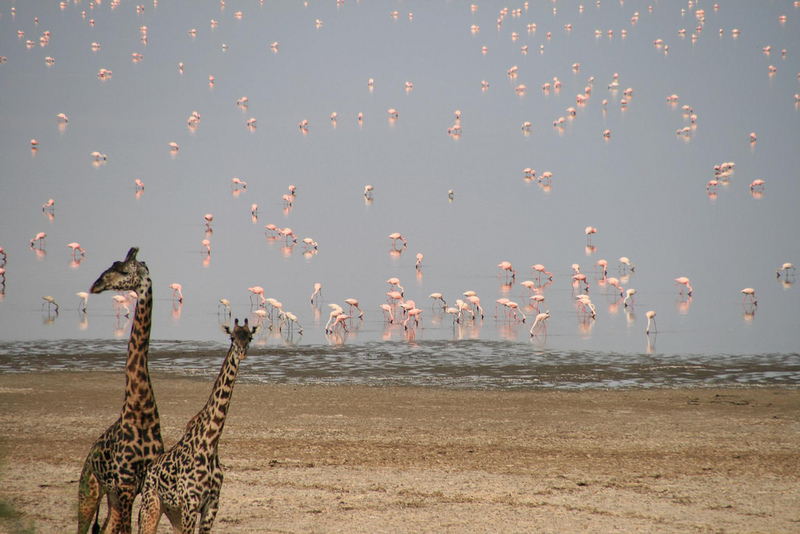 Lake Manyara is a shallow freshwater lake in Tanzania. Said by Charles Gilpin to be the “loveliest in Africa”, it is also the home of a diverse set of landscapes and wildlife. The name “Manyara” comes from the Maasai word emanyara, which is a euphorbia species of plant that is grown into a hedge around a family homestead (Euphorbia tirucalli). Of the 127 square miles (329 km2) of Lake Manyara National Park, the lake’s alkaline waters cover approximately 89 square miles (231 km2). While most known for baboons, the lake and its environs is also home to herbivores such as hippos, impalas, elephants, wildebeests, buffalo, warthogs and giraffes. Giant fig trees and mahogany seen in the groundwater forest immediately around the park gates draw nourishment from the underground springs replenished continuously from crater highlands directly above the Manyara basin. Leading away from the forest to the fringes of Lake Manyara are the flood plains. To the south the acacia woodlands are visible. Leopards, although abundant, are elusive. It can be difficult to catch a glimpse of them, and the same is true of their counterparts, the lions of this park. With an entrance gate that doubles as an exit, the trail of Lake Manyara National Park is, effectively, a loop that can be navigated by jeep within a couple of hours. If driven slowly, this trip can be stretched a few more hours for the purpose of watching, observing and enjoying the diversity of flora and fauna. The Rift Valley escarpment forms a noteworthy landmark and provides a spectacular backdrop to Lake Manyara.